Shootout at the Wheatsheaf Corral! A seismic evening of London League 3 chess took place last night in London W1. A critical relegation fixture in Division 3. Hammer were pitted against the might of Albany, who are gunning for promotion to Division 2. As I said in my last dispatch, this is belt and braces time and Hammer need to deliver. Let me set the scene – for one moment just closer your eyes. Think Clint Eastwood riding into town in “A Fistful of Dollars” – the Ennio Morricone soundtrack in the background. The long gunman facing insuperable odds. Imagine that scene and you will be halfway there to where your Hammer heroes were last night. There was only going to be one outcome as they sat down to fight. As with all things this season, Hammer do not do things the easy way – they are just addicted to pressure. We just have an innate desire to make things as difficult as possible… for ourselves! Last night we were missing Orial, Josue and Marios. Not easy men to replace. We defaulted a game – Sheikh had an unfortunate lapse of memory. Something I cannot reprimand him for because he has been so good this season. It mean that Hammer started this crucial match already a point down. Fortunately Brian, Adam and Robin were able to step up. Hammer were ready. The scene has been set… let’s look at the detail of the evening. The first man to finish was Robin in rapid fashion. Playing white the game was over so quickly I only saw a brief glimpse of it. My memory is of a white Knight on b5 coupled with his usual fianchettoed Bishop on g2 and pawn on d3 setup. That is all I can relate. Hammer were now 1-1. Next up was Safi playing one of his best games of the season, he left his b2 pawn en prise. A greedy black Queen took the bait and then proceeded to get trapped. Safi smoothly converted. 2-1 to Hammer. Things then settled down and the evening wore on. The outcome saw victories for Paul, Adam and myself. Draws for Bajrush, Jeremy and Matteo. 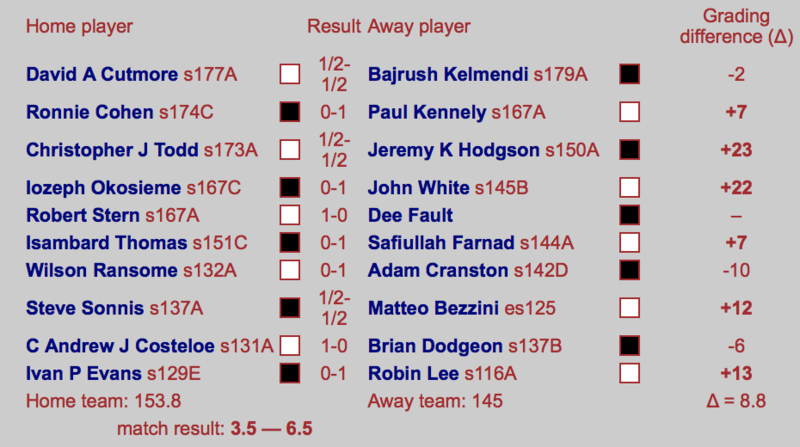 A tough loss for Brian after achieving a winning position, was the only blemish on a great night of Hammer chess. Paul’s game was one of classical manoeuvring and probing. Paul very rarely plays badly and is very solid and logical in his approach. This was another good and deserved win. Hammer now at 3-1. Adam was in dominant mood. I think he was four pawns up at one stage and he only had to negotiate a couple of tactics to secure the win. This he duly did and Hammer cruised to 4-1. Chess is a really easy game if you are playing well and your opponent helps. My win was on the white-side of a Caro-Kann that had elements of an advanced French. Luckily, I came out of the middle game with a passed b-pawn which grew as it advanced up the board. I had multiple ways to win and decided the most prudent course was to head for an endgame with the same number of pawns, but the bonus of an extra Knight. My opponent actually lost on time but his position was completely bust! I was just glad to get the point – Hammer now flying at 5-1. Our WOSF of a Chairman performed his usual Kosovan wizard – turning a lost position into a murky one and then into a draw. How does he do it? Who cares – the match point was secured. 5.5 – 1.5. Jeremy has had a very solid season for Hammer – no losses and standing at 70%. Last night he was solid on every level. Playing black, he agreed the draw when he had the edge but made a pragmatic decision. Hammer now in heaven at 6-2. Finally, Matteo also agreed a draw when a sealed move was imminent. Hammer beyond paradise at 6.5-3.5 win (including our defaulted board). An outstanding result and achieved in the face of tough odds. One slightly sour note is that as a result of the defaulted game we lost half a match point. Hence, we are still not theoretically safe. The last three matches have cost us and now we can afford no more mistakes in our last match against Kings Head on the 9th May. I conclude with a deep, heartfelt thanks to the lads last night and must single out Robin for special mention. Not only did he put himself forward when I was scrambling for a team – he stood down when Jeremy became available. He then responded immediately to my request to step in again when Marios had to withdraw on the day. Robin exemplifies all that is best in the Hammer spirit, and Hammer Chess. Till the next time – live long and prosper my fellow Hammerites!! It was a great evening last night as we marked our first attempt at a Rapidplay evening at Lytton Hall. It’s long been an ambition to organise a fully-fledged internal Rapidplay tournament and last night marked a significant step towards making that a reality. Undeterred by having most of our “big hitters” in a pub somewhere in central London for our crucial Division 3 match, the rest of us rolled-up our sleeves and got stick in to some 30 minute action. It was a thoroughly enjoyable evening with some good attacking chess, and a couple of games that went right to the wire! Hopefully it worked for the guys involved too. Please let us know in the Comments below. It’s amazing how much quieter Lytton Hall is when people know it’ll affect their grade! The night was also significant in that it marked our youngest ever member to take his bow. Yep, we were joined by 9-year-old Nadhmi making his debut for the club, and a very good show he made of it too. He ran me extremely close in his first match, only to lose on time (I wasn’t far behind), but managed to pip Nick in his second. A very solid performance and very happy to have him on board! Other highlights included Shaun chalking up his first graded win! Well done, Sir. Let’s hope that’s a sign of things to come! If there was a winner on the night, we probably have to give that accolade to Ken, emerging with 1.5 points from his 2 games played. But more broadly I hope everyone enjoyed the experience, and let’s see if this can’t pave the way for a more structured Rapidplay tournament next season. More on that at the AGM! Full results below. You should see these results reflected in the July 2017 grades. It was also a real pleasure to see so many new faces at the club. Last night we welcomed a total of 5 new people – Sassa, Panos, Aaron, Dipender and of course, Nadhmi. Sorry we couldn’t include you all in the Rapidplay. We’re a bit hamstrung unless you’re formally ECF-registered! Still, I hope you enjoyed your own matchups and your first taste of Hammer Chess! Hope to see you all again soon. Played 3 quick games against the young fellow. Lost all three one sidedly. Was so upset forgot to ask his name. Any ideas who that was? GLC beat DHSS last night, guaranteeing Hammers can’t go down – as long as no ineligible players are fielded in the last match!